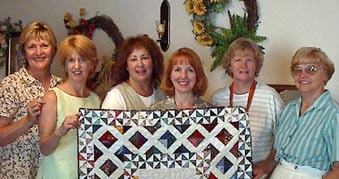 Six of us usually car pool from Paradise to the Chico quilt guild (Annie's Star). 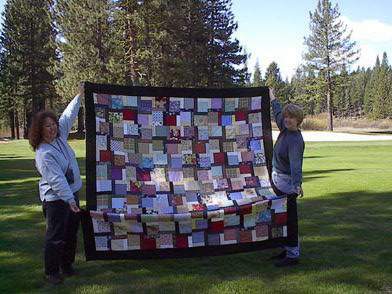 When Elaine got married and said she was moving, we decided to make her a friendship quilt. When Glenna Clark said she was going to retire from teaching, her friends decided to make her a quilt. Squares were pieced in a classroom on January 6, 2001 and then signatures and well wishes were gathered from her many friends. 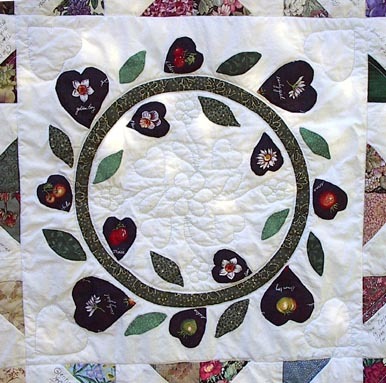 The blocks were assembled, the applique was added and the machine and hand quilting was finished...all by her friends. 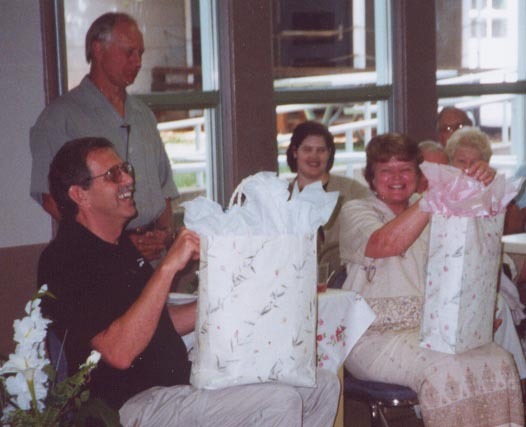 She was presented with her quilt at her retirement party. 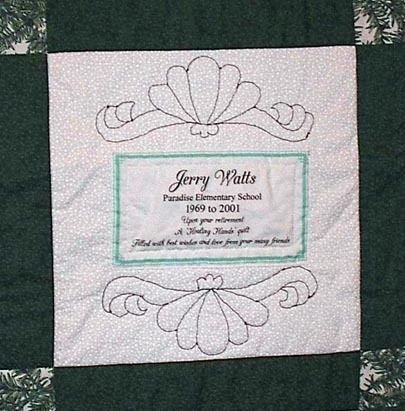 At the same retirement party, another teacher, Jerry Watts was retiring and was presented with this "Healing Hands" quilt. 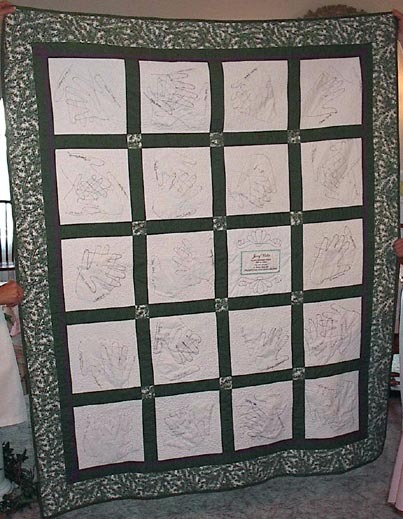 His many friends had traced their hands and added their signatures to his retirement quilt. He will be able to heal quickly from upcoming surgery as the border print fabric is from the Quilt for a Cure line of fabric and titled "Healing Garden." The quilts on this page were all made with friends...each taking part in various aspects of each of the quilts' construction. 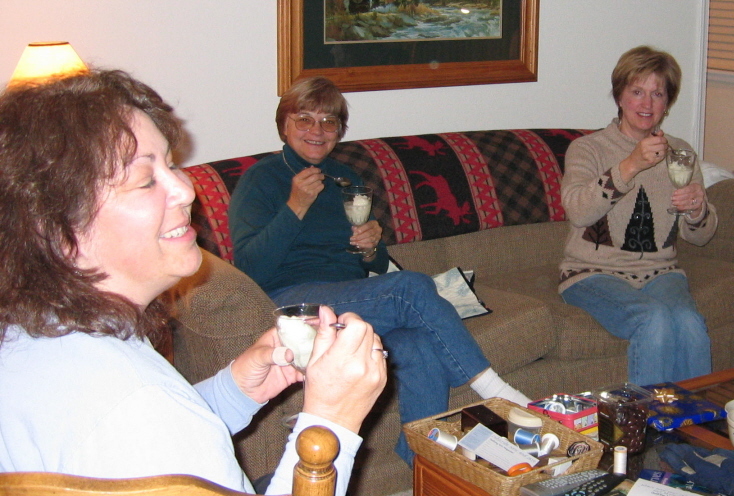 Quilters relax for tea time. 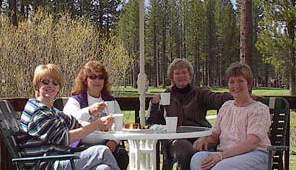 On a spring weekend in 2001, four quilting friends gathered at Graeagle, Plumas County, California for two days of fun...quilting, eating and visiting the Portola Quilt Show. The quilting resulted in the quilt top pictured here, Plumas Pinwheels, made for the Annie's Star Quilt Guild (of Chico, CA) fall quilt auction and Elaine's Quilt pictured above. 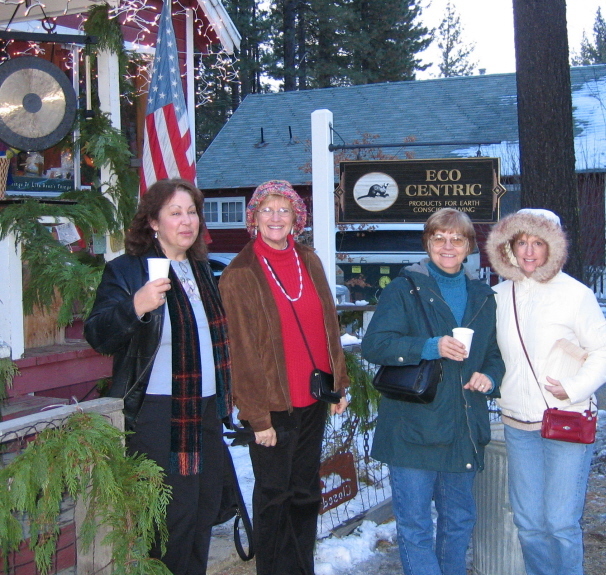 On the first weekend in December 2004, the same four quilting friends above, plus one more, gathered at Graeagle, Plumas County, California for two days of fun...quilting, eating and visiting and shopping at the Graeagle Christmas Celebration. 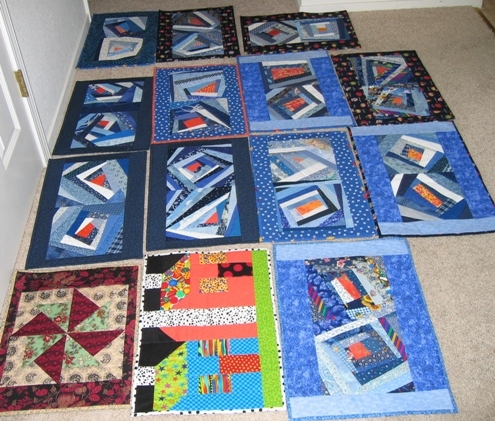 The quilting resulted in making placemats for the Annie's Star Quilt Guild (of Chico, CA) community service to be given to Meals on Wheels to distribute to their clients. 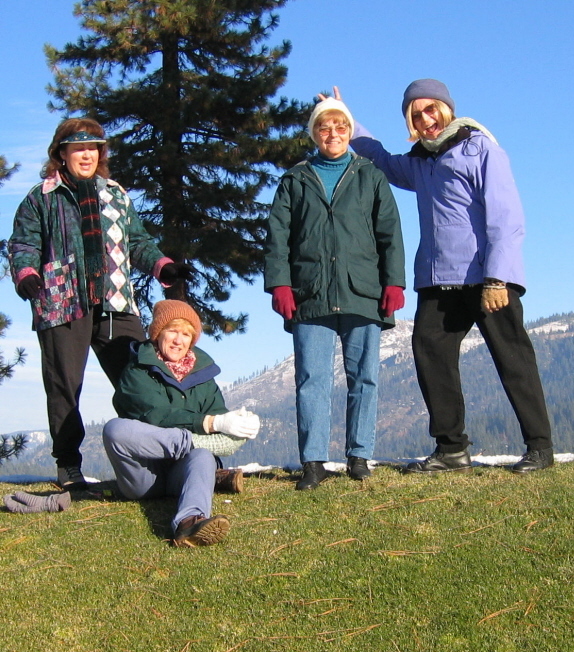 February 2007 and we were back at Graeagle to try a new quilt pattern and create tops for the Annie's Star Quilt Guild (of Chico, CA) community service once more. Below are three tops and also the completed patriotic quilt. 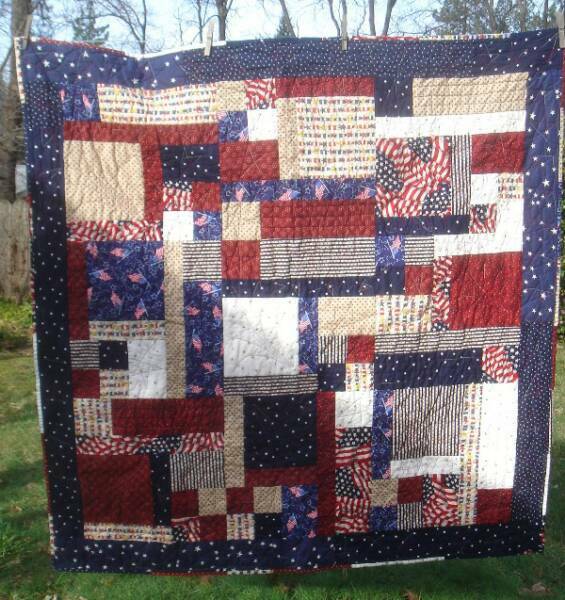 The words "God bless America" are quilted into the quilt. April 2009 at Graeagle and once more we sewed placemats for the Annie's Star Quilt Guild (of Chico, CA) community service to give to Meals on Wheels. 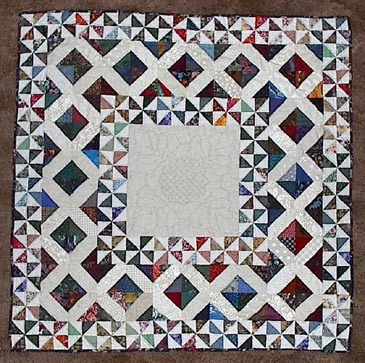 As a beginning, we used Log Cabin blocks Joan Dresser had won at a guild meeting. This year Bonnie McWilliams joined the group. 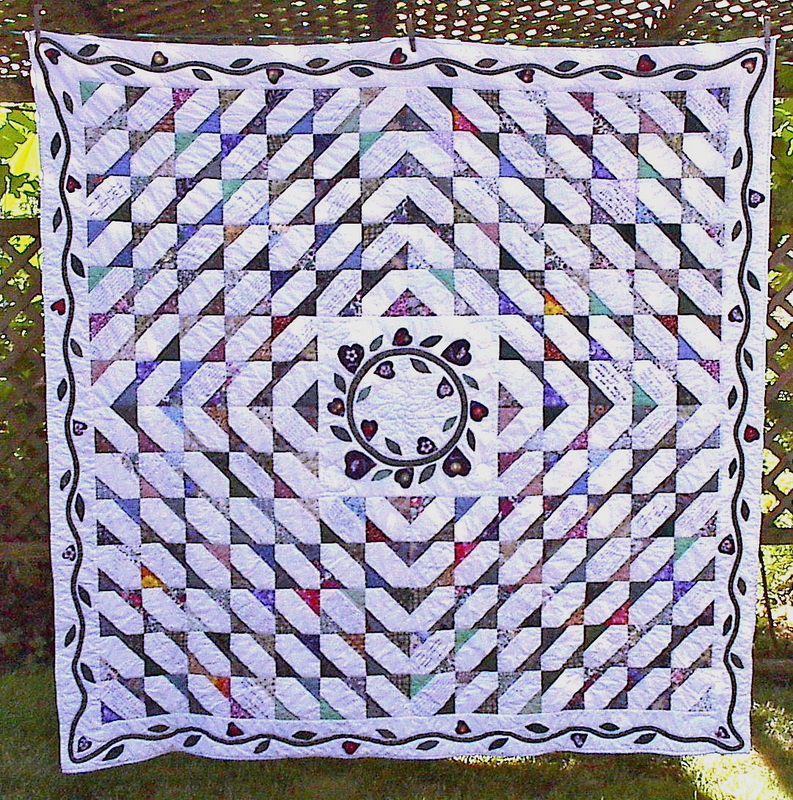 The 2008 Graeagle Quilt Retreat allowed us to try a new quilt pattern and again create a top for the Annie's Star Quilt Guild (of Chico, CA) community service. 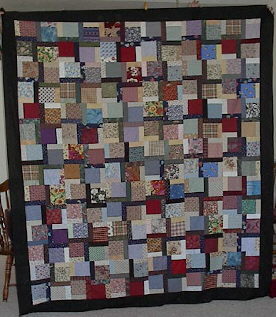 Below is the quilt top we finished. We also had good weather and a chance to lunch on the deck.